Yes, that says anchovies. Don’t stop reading! They are the “secret ingredient” in this dish, one that elevates something very simple to another level. But more on that in a minute. Cold weather began in earnest about a week ago, and my trusty oven has been operating in full force ever since. Roasting is my cooking process of choice this time of year, especially on rushed weekday evenings. Part of the attraction is that its relatively passive, leaving hands and minds free for dealing with stovetop cooking, squeaky kids, and other urgent matters. 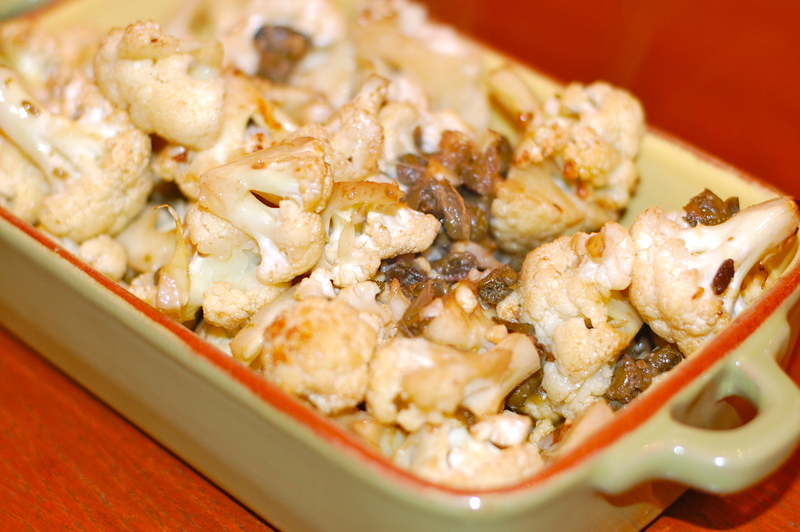 The other great benefit of roasting is that it can transform even the most humble vegetable – cauliflower a perfect case in point – into something sweeter, more flavorful, and tender. 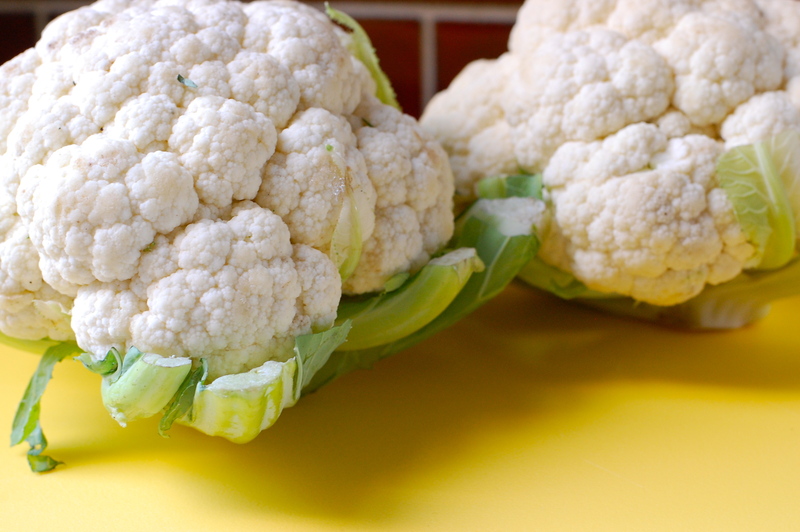 This recipe is one of our family’s favorite cauliflower preparations. The girls love olives and capers (anything pickled actually) so I always overload one or the other into the roasting pan. The anchovies completely disappear in the roasting process, leaving behind tons of tangy flavor, nothing fishy. Throw in garlic too if you like. My goal is to also integrate dried chilies in the future, but I’m not sure how Talia will feel about that. This also makes for an excellent and easy Thanksgiving side dish. Now if only I could rig a way to remotely preheat the oven so its ready exactly when I need it…. 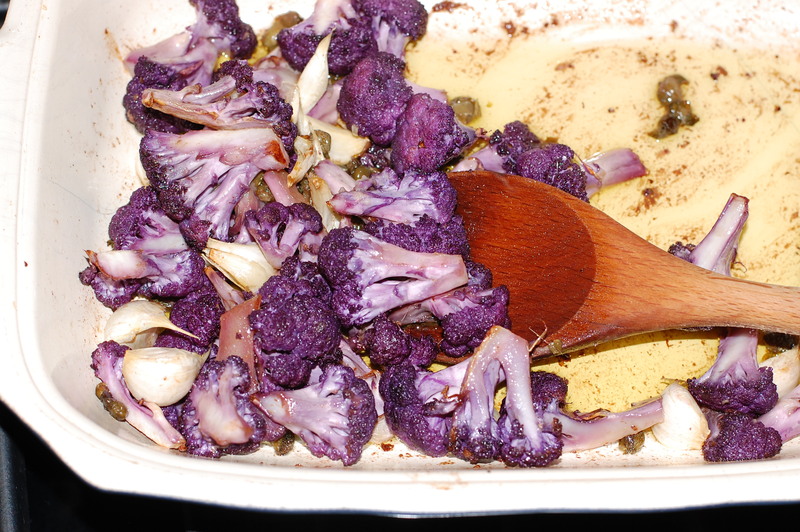 Starting with two medium-sized cauliflower heads (preferably a mix of white, orange and/or purple), wash and cut the florets into bite-sized pieces. Spin or toss to dry a bit, then place into a roasting pan of choice. One hint here: in my oven, it will certainly take longer to cook this dish in a ceramic pan, as opposed to a baking sheet with parchment paper. So opt for the latter if you are in a rush. 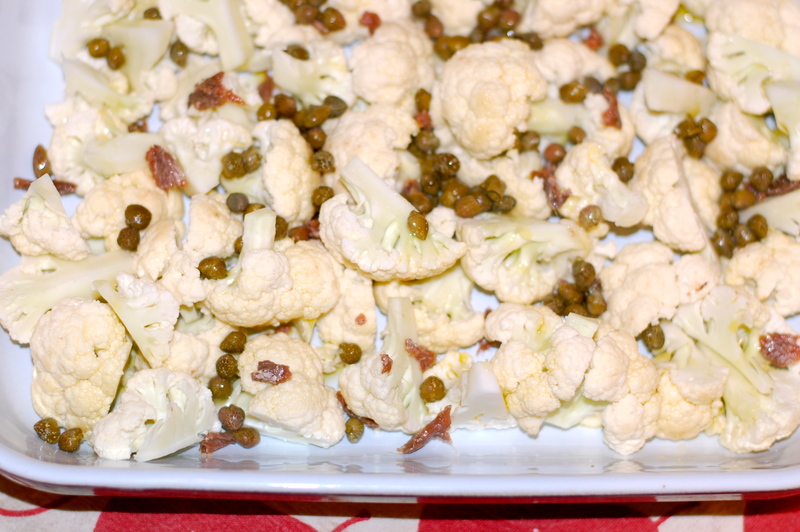 Toss cauliflower pieces with a generous amount of olive oil, 1-3 tbsp. rinsed capers (amount based on personal preference), a head of garlic with the cloves separated (optional), a small handful of crumpled, dried chilies (optional), and 4-6 anchovy fillets torn into small bits. Season generously with pepper before putting it in the oven but hold off on the salt until the vegetables are done. The anchovies inherently add a lot of salt. Roast for 30-40 minutes, until caramelized and tender to the bite. Note: If you prefer faster cooking time in exchange for a little more clean up, steam the cauliflower florets until they are just tender. This will cut the roasting time by at least 10 minutes if not longer (oven dependent).